This section describes the technical approach to achieve the research goals. The research team captured data from a calibrated stereo rig mounted behind the rear-view mirror of a car. The data was processed at 30 frames per second using an Acadia I™ Vision Accelerator Board to compute dense disparity maps at multiple resolution scales using a pyramid image representation and a SAD-based stereo matching algorithm. (23, 24) The disparities are generated at three different pyramid resolutions, Di, i = 1, 2, …3, with D0 being the resolution of the input image. 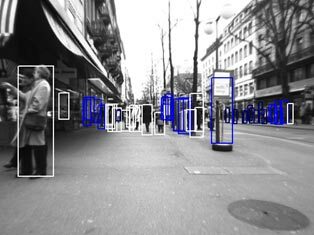 In figure 10, the pedestrian detector (PD) module takes the individual disparity maps and converts each one into a depth representation. These three depth images are used separately to detect pedestrians using a template matching of a 3D human shape model, as described in detail in section 5.2 of this report. The structure classifier (SC) module employs a combined depth map to classify image regions into several broad categories such as tall vertical structures, overhanging structures, and ground and poles to remove pedestrian candidate regions that have a significant overlap. Finally, the pedestrian classifier (PC) module takes the list of pedestrian ROIs provided from stereo modules and confirms valid detections by using a cascade of classifiers tuned for several depth bands and trained on a combination of pedestrian contour and gradient features. The rest of this section describes the algorithms implemented and the results produced by each stage. Figure 10. Illustration. Diagram of the developed system. The proposed system consists of a stereo rig that is made of off-the-shelf monochrome cameras and the Acadia I™ Vision Accelerator Board. The cameras are standard NTSC format 720 × 480 resolution with a 46-degree horizontal field of view. The approach to stereo-based generic object detection framework is based on the techniques introduced by Chang et al. (25) The algorithm introduced by Chang et al. used template matching (through correlation) of pre-rendered 3D templates of objects (e.g., pedestrians and motor vehicles) with the depth map to detect objects. (25) The 3D template matching was conducted in a coarse to fine manner over a two-dimensional (2D) grid overlayed onto the local XY plane. At each grid location, a 3D template was matched to the range image data by searching around the X, Y, and Z directions according to the local pitch uncertainty due to calibrations and bumps in the road surface. Locations on the horizontal grid corresponding to local maximal correlation were returned as candidate object locations. Note that this detection stage must ensure small pedestrian miss rates. As a result, a larger number of peaks obtained by non-maximal suppression is acceptable. The researchers relied on additional steps to reduce the candidates. Around each peak, the area of the correlation score map with values within 60 percent of the peak score was projected into the image to obtain the initial pedestrian ROI candidate set. This set was further pruned by considering the overlap between multiple ROIs: detections with more than 70 percent overlap with existing detections were removed. After this pruning step, a Canny edge map was computed for each initial pedestrian ROI. The edge pixels that were too far off from the expected disparity were rejected. A vertical projection of the remaining edges resulted in a one-dimensional profile from which peaks were detected using mean shift. (26) A new pedestrian ROI was initialized at each detected peak, which was refined first in the horizontal direction followed by the vertical direction to get a more centered and tightly fitting bounding box on the pedestrian. This involves using vertical and horizontal projections of binary disparity maps (similar to using the edge pixels above) followed by detection of peak and valley locations in the computed projections. After this refinement, any resulting overlapping detections were again removed from the detection list. The above approach allows detections of pedestrians and vehicles up to a range of 131.2 ft (40 m). Figure 11 through figure 14 show examples of pedestrian detection performance. 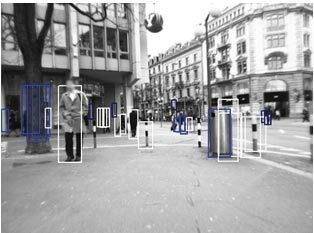 In the figures, the white boxes indicate possible pedestrians, and the blue boxes indicate possible pedestrians to be further analyzed by an appearance classifier. Both true detections and typical FPs are shown. The objective of the following modules is to reduce the FPs. V: Tall vertical structure (magenta). An occupied cell in the range map of a scene provides evidence for the presence of one or more of the structure classes. The structure classes outlined above typically span multiple adjacent cells in a scene with discontinuities at the boundaries of the classes. Therefore, local evidence for the presence/absence of a class can be combined with neighborhood constraints to probabilistically estimate the class labels. The range map from the stereo does not provide enough resolution to differentiate between a group of people and a motor vehicle. As a result, the research team labels all motor vehicle-like objects as object candidates and allows the appearance-based classifier to resolve detections in these regions. These classes have been chosen to competitively label pixels among a few commonly occurring structures as a precursor to PC versus non-PC. This is in contrast to traditional detectors that directly apply PC/non-PC in which the negative examples themselves form a large set of structured classes. The research team further separates the structured classes into classes that are distinct from the pedestrian class. In this method, if large numbers of pixels can be rejected as being part of generic structural classes, the system substantially reduces the number of false hypotheses that are presented to a PC/non-PC, gaining both in performance (FP rate) and computation. The research team performed structure classification using depth maps. An example depth map is shown in figure 15. The map is pseudo-colored with red denoting close-range objects, cyan denoting far-off objects, and black denoting missing depth. The depth map illustrates a number of issues: (1) objects appear bloated in the range map due to the stereo integration window,(2) the characteristic noise in the range values is observable as scattered fragments, and(3) the occlusion boundaries between objects are noisy. To handle depth map errors, first, the research team defines a structure called the vertical support histogram (VSH) to accumulate 3D information over voxels in the vertical direction (see figure 15). In a given frame, the system will compute a feature vector using this structure and subsequently use the feature vector to learn the likelihood of each pixel belonging to a given structural class. Next, the team makes use of the scene-context constraints arising from the camera viewpoint by formulating the labeling problem as an MRF, where the smoothness constraints allows the team to reason about the relative positioning of the 3D structure labels in the image. This reduces error in labeling due to depth inaccuracies and gives a smooth labeling of the scene. Figure 16. Equation. Bayesian rule. In the above equation, p(r), which is the density function of r, does not affect the MAP solution. The following section describes the approach to estimate the likelihood densities p(r | ) and the prior probabilities P( ) for this labeling problem. The likelihood densities for the structure labels are estimated by first computing VSH, determining the likelihood of the structure labels using VSH information, and modeling the smoothness inherent in scene structures. Each of these steps is described in more detail below. 17. Equation. VSH for a given grid cell. In this equation, S gi measures the support for the ith-bin of the histogram. Figure 8 shows how image points and the corresponding depth estimates are mapped to 3D distributions for an example histogram with k = 3 bins. Three ranges are chosen to capture the typical vertical characteristics of structures of interest which result in three histograms: hlow , hmid , and hhi . In order to compute the supports, S g, from noisy range estimates at each pixel, the researchers uses a mean-around-the-median estimate of range. If a wxh patch is defined at each pixel (X, Y), a robust range estimate is computed for each patch (in the following, pixel and patch are used interchangeably, with the idea that the context makes the sense clear). Image points, (X, Y), with the range estimate, Z, are mapped to the corresponding (X, Z) grid cell with height estimate Y. Y is used to increment the appropriate bin of VSH at (X, Z). Figure 18. Equation. Maximum number of pixels in each image row. Figure 19. Equation. Maximum number of image rows in a specific height band. Figure 20. Equation. Normalization factor for each cell in which VSH is calculated. Figure 21. Equation. Feature vector extracted from each image patch. VSH captures the distribution of 3D points in any given scene in terms of quantized height bins. V(X, Z) is a representation of the scene in front of a camera. In order to associate each image patch with structural labels, the researchers compute the likelihoods for the augmented feature vector, rp, conditioned on the specific structural labels defined earlier. All buildings should at least have support in hmid . All candidate objects should have a low Hp and at least have support from hlow (and some support from hhi when under overhanging structures) and all overhanging structures should have a high Hp and at least have support from hhi and lack of support from hmid. Figure 22. Illustration. Two views of the feature space showing the distribution of vectors from which the class conditional likelihoods are estimated. Table 2. Parameter settings for SC. Figure 23 through figure 26 show the various steps of the likelihood density estimation process for one frame. Note that, in particular, the vertical structure likelihoods in figure 26 capture the visible extent of the buildings all the way to the base, a task that is difficult to achieve with a simple heuristic on H.
Figure 24. Illustration. Top view of VSH components: hlow (left), hmid (center), and hhi (right). Figure 25. Illustration. VSH projected on to the image (left three images) and the height of each pixel (right). Figure 26. Illustration. Likelihoods conditioned on the four labels: candidate objects, vertical structures, ground, and overhanging structures. Figure 27. Equation. Kernel density estimation on the feature vector extracted from each image patch. r ci = The feature vectors of all the patches. i = The training set belonging to the class c.
H = A bandwidth matrix which scales the kernel support to be radially symmetric. Figure 28. Equation. Bi-weight kernel used in the kernel density estimation function. The bi-weight kernel is efficient to compute, and the research team found that it had a comparable performance to more complex kernels. Figure 29. Equation. Gibbs distribution used to model the prior probability. L is a random field. The label for a particular patch given those of all other patches depends only on the labels of the neighboring patches. These are reasonable assumptions in this scenario. For example, the identification of a patch as a building patch might depend on whether its neighboring patches are ground but has little to do with the identity of the patches far away spatially. The next step is to define the smoothness cost, Es, from which the prior probability P(L = ) can be computed. The smoothness term can be used to model valid configurations of scene objects possible from the camera viewpoint. Thus, for each patch, its neighboring patch will be considered, and the cost of associating a pair of labels with the two patches will be defined. The neighboring patch is defined as the patch that is four-connected to this patch and is also close in its world depth, Z w. Thus, two patches, which are neighbors in the image space but distant in the world space, are treated to have no conditional dependence on each other's labeling in the MRF network. This condition essentially cuts the grid graph along depth discontinuities before the MRF framework starts any label propagation. The remaining neighbors are now depth neighbors as well, and it is easier to reason about what objects can (or cannot) be near other objects. Figure 30. Equation. Binary variable used to test the depth neighborhood of image patches. Figure 31. Equation. Smoothness cost associated with each image patch pair. In the above equation, ρbp is the constant weight factor applied to the smoothness term and is set empirically, L(p) and L(q) are the labels of p and q, and D(.) is a function that measures the compatibility between those labels. The PC layer consists of a set of multirange classifiers. Specifically, three classifiers are trained for distance intervals of 0 to 65.6, 65.6 to 98.4, and 98.4 to 131.2 ft (0 to 20, 20 to 30, and 30 to 40 m) where a specific layer is triggered based on distance of detected target. This is inspired by the fact that under a typical interlaced automotive grade camera with a resolution of 720 × 480 pixels, pedestrian ROI size on image varies substantially. For example, people who are 98.4 ft (30 m) away or farther appear on image around 25 pixels or smaller. Thus, it is desirable to handle them with approaches tuned to each specific resolution variations rather than from a single classifier covering mixed resolutions. Each of the three distance-specific classifiers is composed of multiple cascade layers to efficiently remove FPs. For the optimal performance of the target application, the classifiers are designed with different approaches (i.e., for low latency detection at short ranges and detection at farther distances). 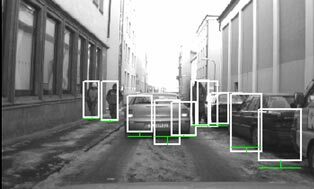 The first classifier is designed to reliably classify high-resolution pedestrians in a computationally efficient manner. 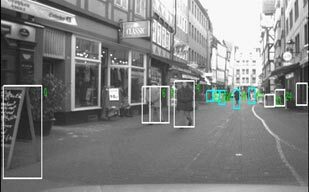 In general, for pedestrian detection approaches reported thus far, it is often required to search for optimal ROI position and size to obtain valid classification scores. (6, 10, 14) This is due to the sensitivity of classifier to ROI alignments that results from rigid local feature sub-ROI placement inside the detection window. This result would require exhaustive search over multiple positions and scales for each input ROI. Aside from computational overhead, the classification score also becomes sensitive and often produces false negatives. Note that there are approaches, such as codebook-based approaches, that do not require global ROI search; however, they typically show inferior performance to approaches with fixed sub-ROI. (14, 6) False negatives can also happen when pedestrians appear against a complex background (i.e., highly textured). In this case, typical image gradient-based features become fragile due to the presence of multiple gradient directions in a local image patch. The research team addressed this issue by designing a classifier that combines contour template and HOG descriptors, which helps with local parts alignment and background filtering (see figure 32). Figure 32. Photo. Process of contour and HOG classification for (a) fixed sub-ROI, (b) local ROI, (c) foreground mask from contour matching, and (d) filtered HOG directions underlying masked regions. The research team uses a collection of templates of shape contours for each local feature window. That is, each feature window (i.e., sub-ROI) contains examples of contour models of underlying body parts that can cover different variations. For example, a sub-ROI at head position contains a set of head contours samples of different poses and shapes. Figure 33 provides an example of local contour models. Figure 33. Illustration. Example of local contour models. Given a pedestrian ROI, each local feature window can search in a limited range and lock on underlying local body parts. In addition to computational efficiency, it can better handle local parts deformation from pose changes and shape variations. It can also overcome ROI alignment issues. The part contour models consist of edge maps of representative examples. Each sub-ROI contains 5 to 12 such templates. Contour template matching is achieved by chamfer matching. For each sub-ROI, the chamfer score is computed for each template model. The refined sub-ROI position is then obtained from mean position of maximum chamfer scores from each template (see figure 34). From the contour template, a foreground mask can also be composed by overlapping binary local templates at each detected position that is weighted by matching scores. The foreground mask is used as a filter to suppress noisy background features prior to classification step. Figure 34. Equation. Foreground mask for the contour template. CtrsubROI (ix,y ) = Center of local sub-ROI. M FG = Foreground mask. I Conttempl = Binary contour template. Ctrtempl( i; Ich ) = Center from chamfer matching score with the ith kernel image. Given refined sub-ROI and foreground mask, the research team applied a HOG-based classifier. The HOG feature is computed by using refined sub-ROI boxes where gradient values are enhanced by the weighted foreground mask. Each of the three images displays the original image, the foreground mask generated from local part templates, and the resulting edge filtering. Note that local contour parts can capture global body contours at various poses from its combinations; however, this does not form a conforming pedestrian mask for negative patches. 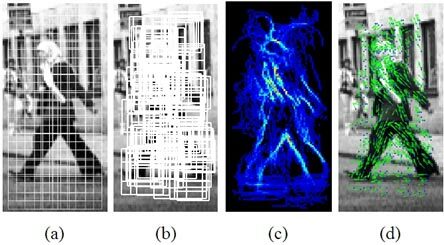 Figure 35 shows examples of a foreground mask and negative patches on pedestrians. Columns 3, 6, and 9 in figure 35 show the results on negative data. On the pedestrian images, the proposed scheme can refine the ROI positions on top of matching local body parts and can enhance effectively underlying body contours. The mask also produces nonconforming shape and position on negative examples. This scheme produces efficient and reliable performance on relatively high-resolution pedestrian ROIs. However, as pedestrian ROI size becomes smaller, it faces a problem as contour extraction and matching steps become fragile under low-resolution images. As a result, the researchers employ conventional HOG classifier at farther distances of pedestrian ROI (less than 35 vertical pixels). Figure 35. Photo. Foreground mask examples. At the second and third levels, the research team uses a cascade of HOG-based classifiers. The HOG classifier proved to be effective on relatively low-resolution imageries when body contour is distinctive from the background. Each classifier is trained separately for each resolution band. Gaussian smoothing and subsampling is applied to match target image resolution, where 25 (at 82 ft (25 m)) and 17 (at (114.8 ft (35 m)) are nominal pixel heights for the distance interval. Note that at farther distances, the image contrast is reduced as pedestrian ROI size becomes smaller. To compensate for this reduction and to meet scene dependent low-light situations, a histogram normalization step is used that is based on histogram stretching. For each ROI, the research team applies local histogram stretching where the top 95 percent gray value histogram range is linearly extended to cover 255 gray levels. As opposed to histogram normalization, it does not produce artifacts at low contract images, yet it can enhance underlying contours. 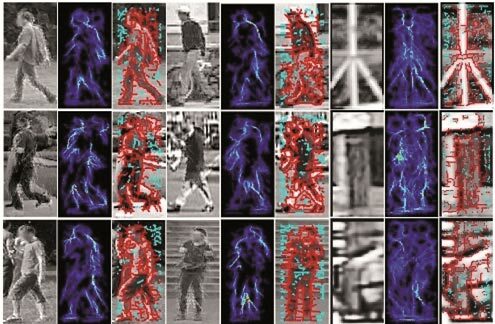 The research team implemented a pedestrian tracking method designed to complement intermittent missing target detection and to allow further analysis of spatial-temporal feature spaces (i.e., motion cues) to enhance classification performance. Figure 36 provides an overview of the pedestrian tracker. The red box indicates the object inside it was identified as a pedestrian, and the green shading indicates the pixel region (pedestrian’s trace) that was occupied by the pedestrian in subsequent frames. Figure 36. Photo. Overview of the pedestrian tracker. The tracking method consists of two steps: (1) 3D feature-based camera motion estimation and (2) image correlation-based ROI tracking. The research team’s visual odometry system computes 3D motion of the camera, specifically rotation and translation of a vehicle between adjacent frames with respect to the ground plane. To compute camera motion, the system first extracts feature points on each frame where features are obtained from corner points from various scene structures. Next, the correspondences between adjacent frames are established by using random sample consensus-based point association. Given correspondences, the relative camera motion can be computed by solving the structure from motion equation. The estimated camera motion parameter is used to predict the location of the detected pedestrian boxes on image (ROI) in the current frame. The camera motion-based prediction is important to accurately localize ROIs under large image motions such as turning. Given the predicted location of the ROI from the previous frame (t-1), the new location in the current frame (t) is estimated by patch correlation-based tracker module. The correlation-based tracker refines ROI position by searching through multiple candidate positions and scales of the enlarged prediction window that matches the highest appearance similarity with the corresponding ROI image patch. Figure 37 provides an equation for an image correlation tracker. Figure 37. Equation. Image correlation tracker. ROIs go outside the image boundary. Reconfirmation of the pedestrian label from the classifier does not occur during tracking. Figure 38 shows a pedestrian tracker. Figure 38. Illustration. Pedestrian tracker data flow.